Someone at my home institution, the University of the Western Cape, has decided that the way to attract students is to wave a picture of mouldy bread at them. Presumably they don’t think that having top class postgraduate programmes at places like BCB or PLAAS or SANBI is worth advertising. Nope, instead we should talk about mouldy bread. Or rather, a myth about Alexander Fleming and mouldy bread. Thus the modified (Gimped in fact) image to the left. 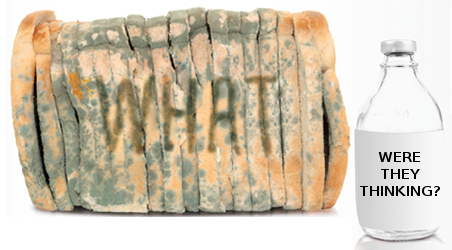 So it was a lazy attitude towards cleaning the lab — not mouldy bread — that led to Fleming’s discovery. That’s the first thing this blurb got wrong. What offends me more, however, is the clichéd image of the heroic scientist’s discovery sparking a paradigm shift. In reality, the antibacterial effect of Penicillum was known before Fleming, with a range of scientists and traditional knowledges describing the antibacterial effects of mould, or of Penicillum specifically. Just four years before Fleming’s discovery, Andre Gratia and Sara Dath discovered the antibacterial effect of a species of Penicillium, also as result of contamination of a bacterial culture. What made Fleming’s discovery significant was not the moment of discovery and subsequent insight, but rather what he did afterwards: instead of merely publishing a paper and moving on to another topic, he spent years trying to get other scientists — chemists especially — interested in the new substance’s potential. It was just over a decade later that Howard Florey’s team assembled a strange collection of baths and milkchurns as part of the first penicillin production line. Before Florey, however, there was Dr Cecil Paine, a student of Fleming‘s, who used a crude penicillin extract to successfully treat an eye infection in 1931. (Paine later was a colleague of Florey’s) And Ernst Chain, the scientist in Florey’s lab that led the penicillin research, allegedly extracted the compound from a sample of mould that had been sub-cultured from Fleming’s original isolate. Florey’s science also drew on the clinical trials conducted by his wife, Ethel Florey. So the links between Fleming, the Floreys, Chain and the practical use of penicillin drew on a rich culture of openness and experimental. In addition, as efforts got under way to industrialise penicillin production, Sara Dath’s work in collecting a “monumental number of moulds and bacteria” proved useful. Science was then, and is now, a product of a process of collective enquiry and effort, and while “scientific interest” is key, reducing the story of penicillin to a Scot staring at stale bread does violence to history. And UWC could do better than to peddle this mouldy myth.